As often happens with most of my ski trips, I got busy with other things after each of these 2 trips, and so never wrote trip reports for them. 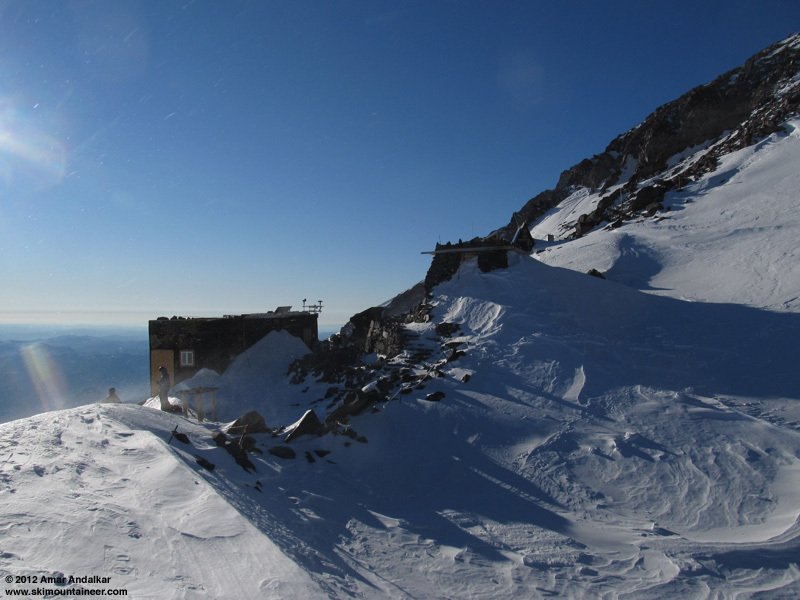 But I've been thinking a lot about these 2 trips up to Camp Muir, which took place during that last week of sunny nice weather before the current intense two-week storm cycle hit -- the storm cycle that has left 4 people missing and still not found over two weeks later, lost somewhere up on the Mountain. Suddenly tonight I just felt like writing about these trips. The second of these trips took place only a day before one of the missing parties parked their car in the Paradise parking lot around 10am on Friday January 13th -- a car which would remain in public view on the east webcam looking out at the parking lot for the next 10 days, slowly becoming buried under the nearly 10 ft of snowfall which occurred -- a constant reminder of the missing, until finally dug out by park rangers on the 23rd and towed away around 7pm that evening. 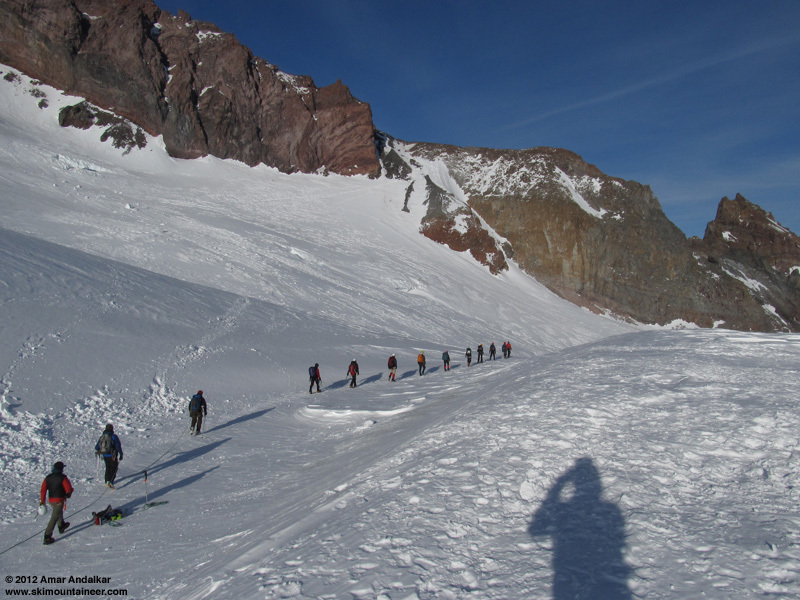 Sad to think that I was probably the only person to ski from Camp Muir twice that week, safe under the benefit of stable weather and sunshine, enjoying the relative calm before the perhaps-fatal incoming storm that overtook those 4 others. And doubly sad to remember that these two trips had taken place just after the Park had reopened, following the week-long closure after the fatal shooting of park ranger Margaret Anderson on New Year's Day. 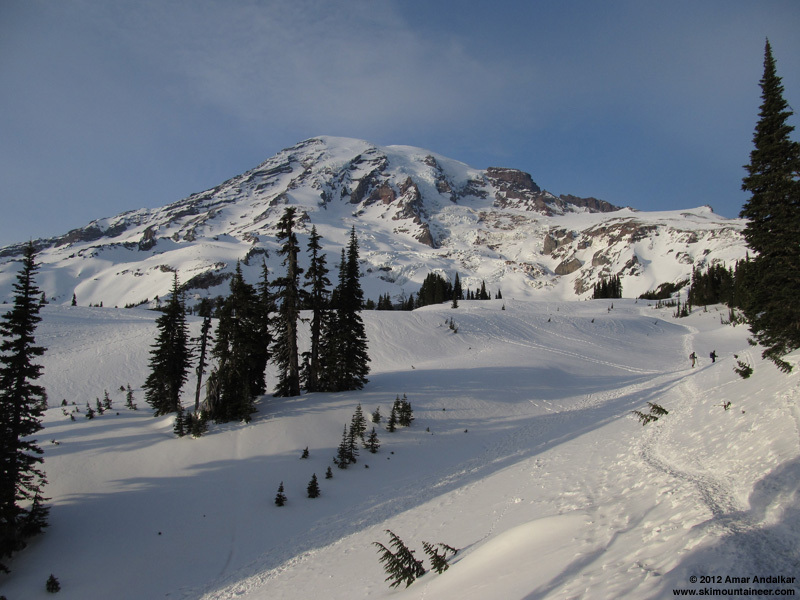 The park reopened on Saturday January 7, but the forecast for that day was mostly cloudy while Sunday was expected to be much nicer, partly sunny. Entrance to the park was free that weekend, since they lacked sufficient staff on duty who were trained to handle money. We drove up past Barn Flats, site of the fatal shooting, surprised to see no flowers or markings visible there, and arrived at Paradise to find the weather even better than forecast. It was totally sunny, windless, and quite warm as we headed out after 11am. Approaching Pan Face and even atop Pan Point, it was warm enough to be shirtless weather for my partner, the inimitable Dave Brown. 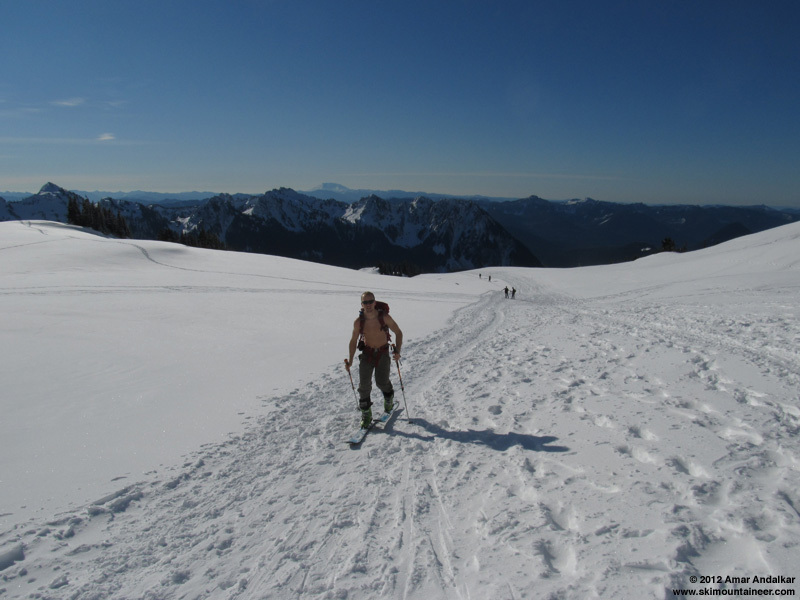 It was sketchy skinning up Pan Face as it often is, with a thin layer (up to a few inches) of yesterday's new powder atop an icy crust -- I was happy to use ski crampons, but Dave managed without them, relying on his mad skinning skillz instead. The winds eventually picked up above 7000 ft and a few clouds drifted by as we contoured through the Pebble Creek rolls, gaining the toe of the Muir Snowfield without any loss of elevation by proper route choice and also avoiding the nearly-bare icy rocks of the winter route along the ridge, which everyone else seemed to be taking for whatever reasons. I've never understood the sheep-like attachment of many skiers to the so-called winter route here, even when it's rocky and mostly bare of snow, while ignoring the shorter more-direct summer route through the Pebble Creek rolls, which invariably has less rocks and more-continuous snow during low-snow conditions. It's good to pay attention and do some route-finding if needed, even when just going to Muir -- there's no point in following previous skin tracks when they're clearly headed towards a rocky mostly-bare ridge, and a better route exists nearby with more snow and no extra elevation gain or loss. 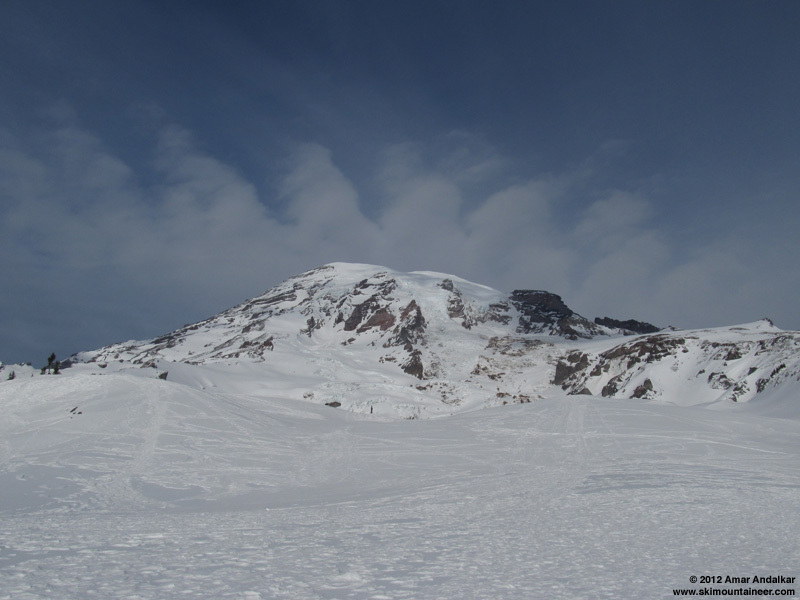 The gusty SW wind kept things cool on the Snowfield, and we watched a large avalanche plunge thousands of feet off of Nisqually Cleaver around 1:30pm. 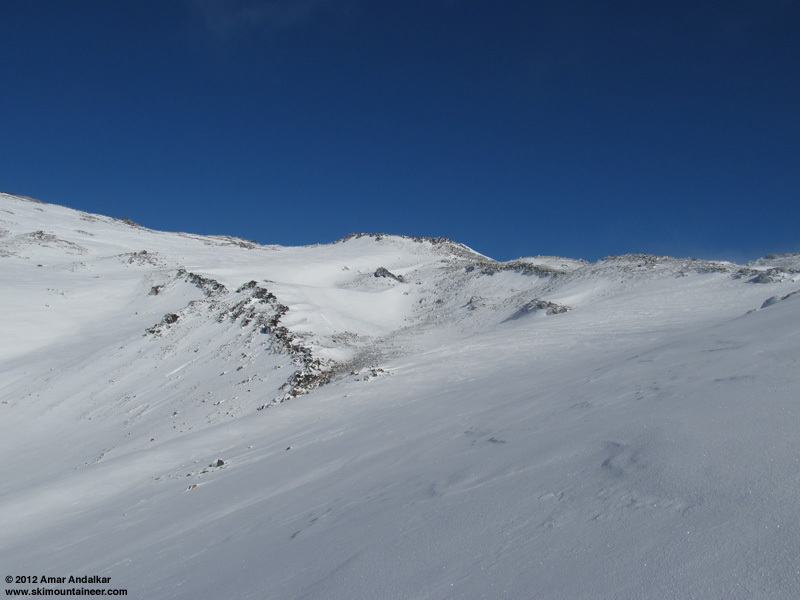 The snow surface was wind-packed powder, with large areas of sastrugi but almost no ice, and ski crampons were not needed at all on the Muir Snowfield this day. The ski descent was much better by staying far to skier's right, which had relatively smoother snow with less sastrugi. While leap-frogging and shooting photos of each other, we managed to get separated through some confusion (it can happen, even on a nice sunny day, even with a very familiar regular ski partner!). I ended up skinning back uphill for a second run of about 1000 vert, thus getting a chance to enjoy the sunset views. Took a peek down Nisqually Chute, but the snow was very firm at the entrance and it didn't seem like a good idea to drop down it. No previous ski tracks were visible. 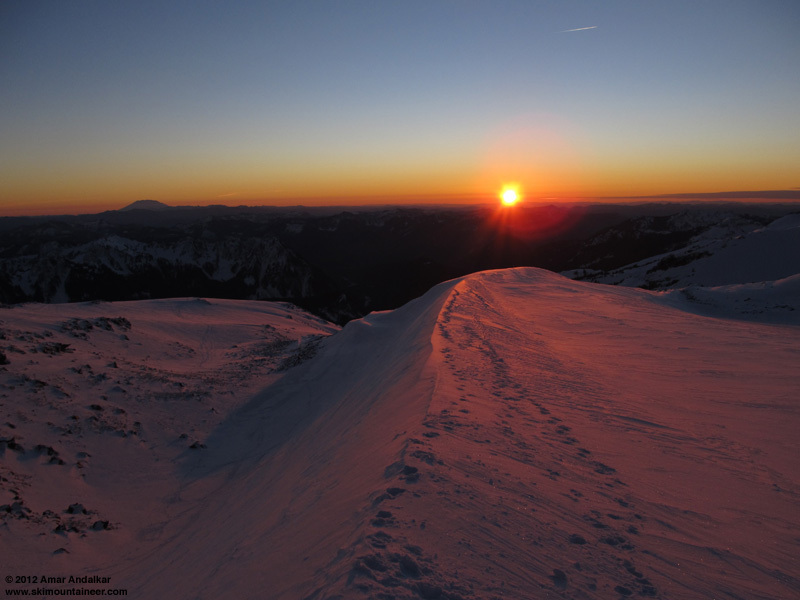 Back to the main Snowfield for the rest of the descent, the sun finally setting as I passed the Pebble Creek rolls. Rejoined Dave in the parking lot in the fading twilight, each of us glad that we'd both arrived safely although separately. About as nice a day as you can hope to enjoy in January up high on the Mountain. A weak front brought a couple inches of new snow on Monday night into Tuesday, followed by high pressure rebuilding Tuesday evening and expected to remain through Thursday or Friday. Might as well head back to Muir. Wednesday offered the lightest winds but temps would still be cold, while Thursday would be warmer but with increasing winds -- I picked Thursday and it was fine, but regretted not having picked Wednesday instead, it was probably even nicer. Lots of high clouds on this day, another 11am start from Paradise, solo this time. Disconcerting to see heavily armed rangers with [POLICE] written on their backs still patrolling the parking lot. 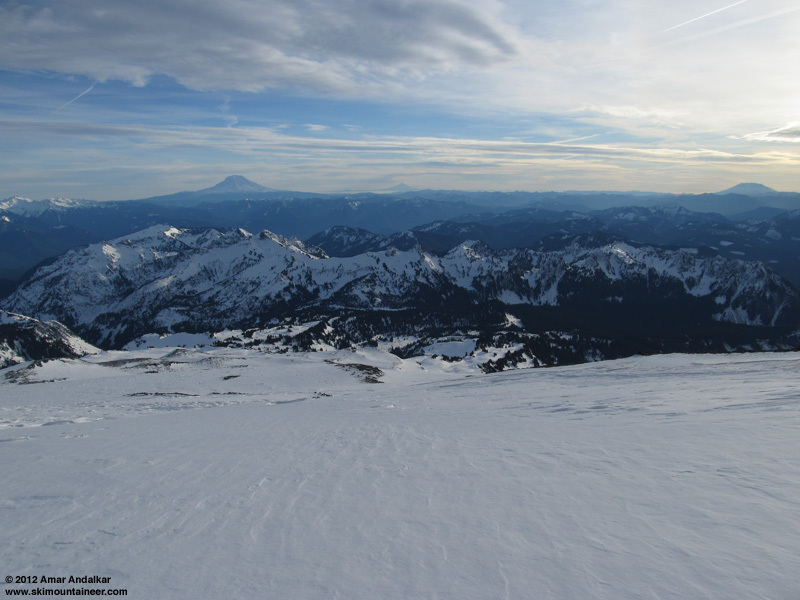 Despite the few inches of new snow 2 days earlier, snow conditions were almost identical to Sunday. The high clouds soon faded and skies became mostly sunny as expected, with some interesting wavy clouds forming briefly above the Mountain. 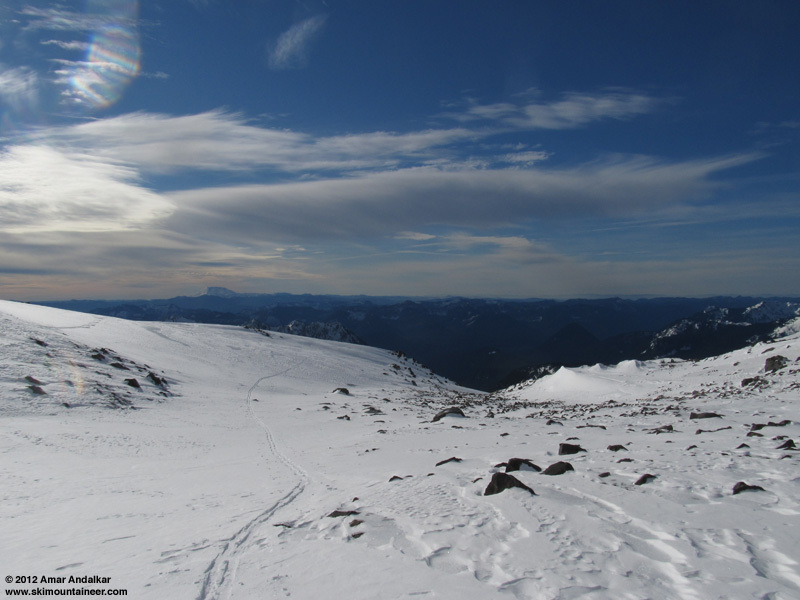 I was surprised to encounter to a party of three skiers on foot with skis on their large overnight packs, descending the winter route near 7200 ft. I asked them why they weren't skiing down, and they said the ski conditions were terrible. 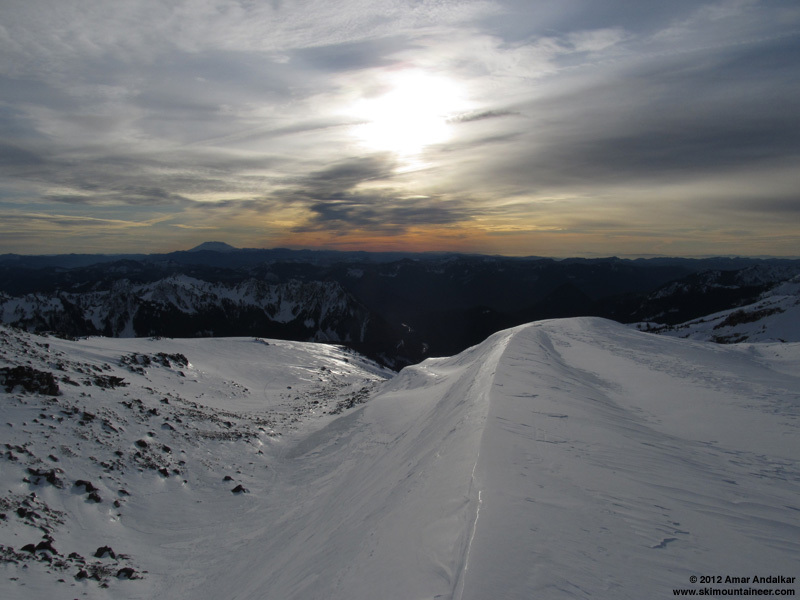 It turned out that they had skinned to Muir, left their skis there, and summited on foot via the Ingraham Direct the day before, enjoying Wednesday's light winds even on the summit, and reporting that the ID route was in decent shape crevasse-wise, but was too firm for skiing in their opinion. 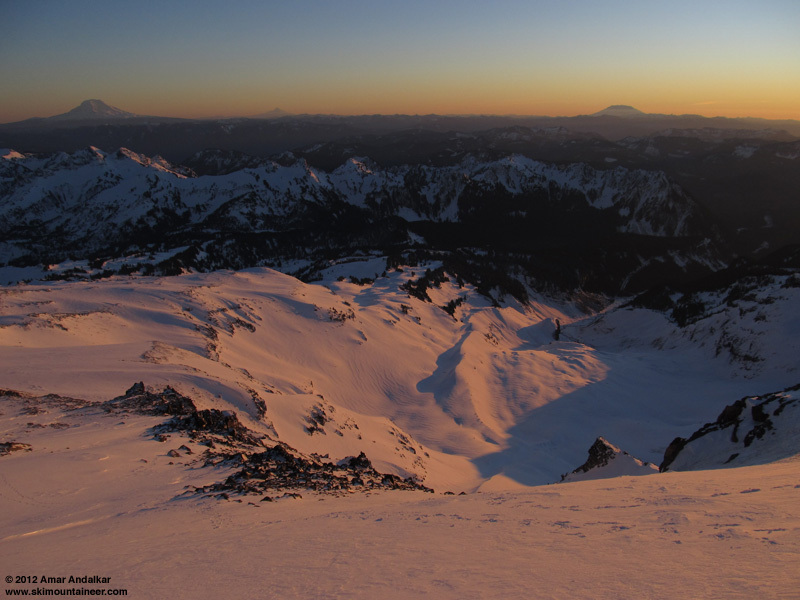 I congratulated them on their winter Rainier summit, and then contoured left towards Pebble Creek. 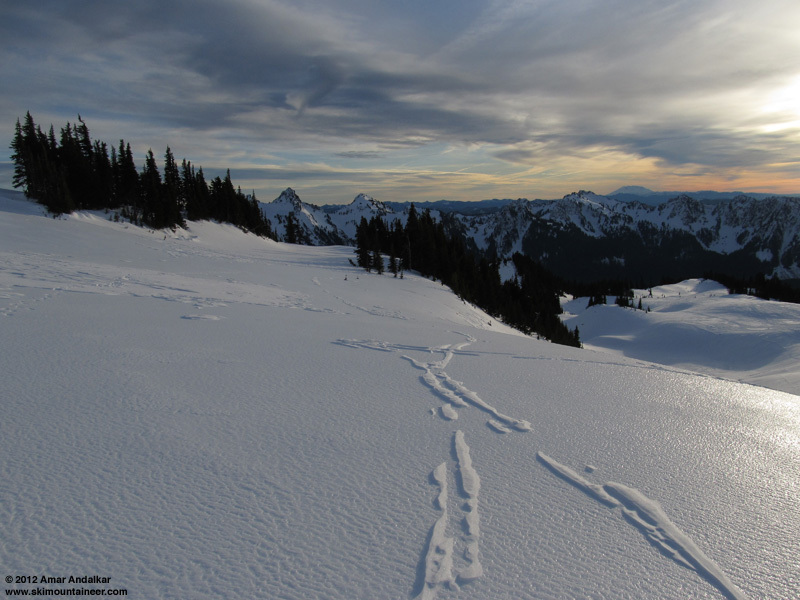 The snow surface was still mostly wind-packed powder, and I could still see portions of my skin track from Sunday in places, while other areas had enough new snow to require breaking a new trail. 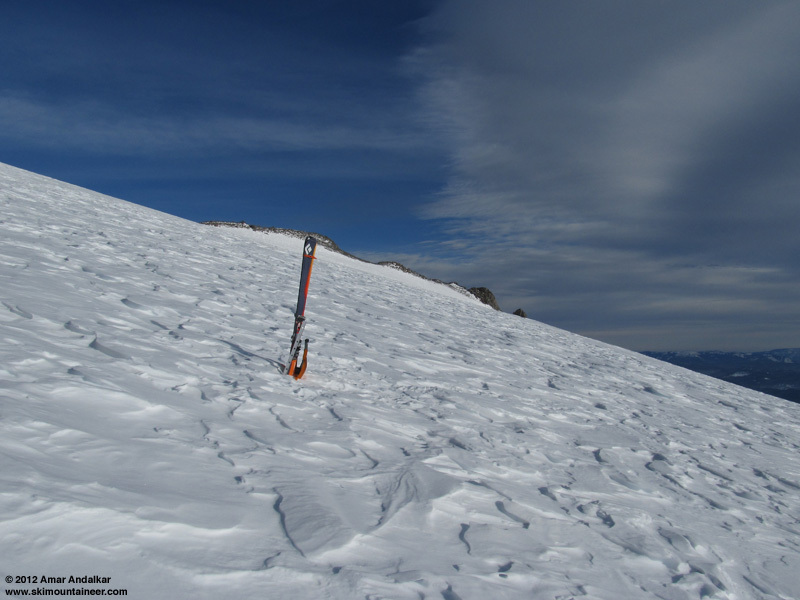 Much higher, near 9400 ft, I was again surprised, this time to find a pair of skis standing in the snow along with a shovel and picket. They were still there when I skied down later, and I saw no other skiers anywhere who might have been their owners -- a minor mystery. The SW winds were gusty this day too, very similar to Sunday. Arrived at Muir to find a busy scene, totally unlike Sunday, with an RMI winter seminar of about 15 climbers and guides, heading out onto the Cowlitz for practice of some sort. 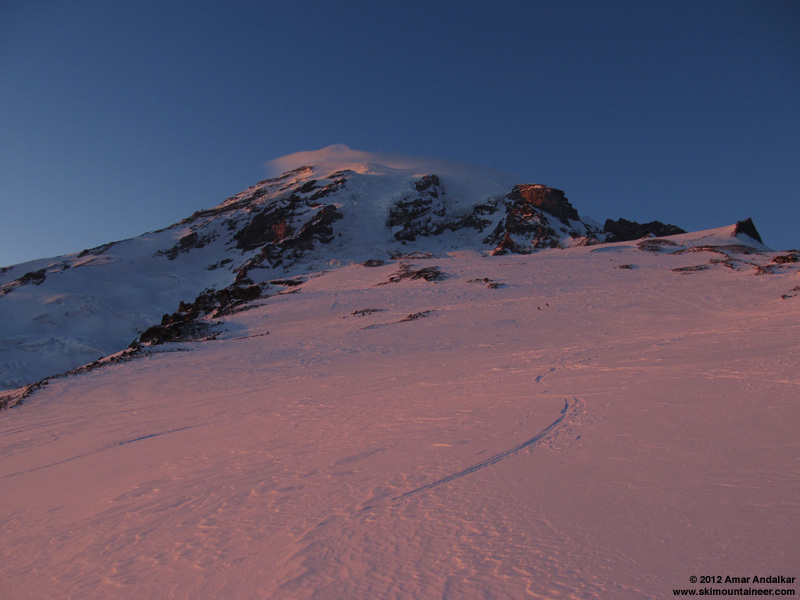 They had made a summit attempt that morning, turning around due to high winds above 12K -- it sounded like Wednesday had been the right day for a January Rainier summit! 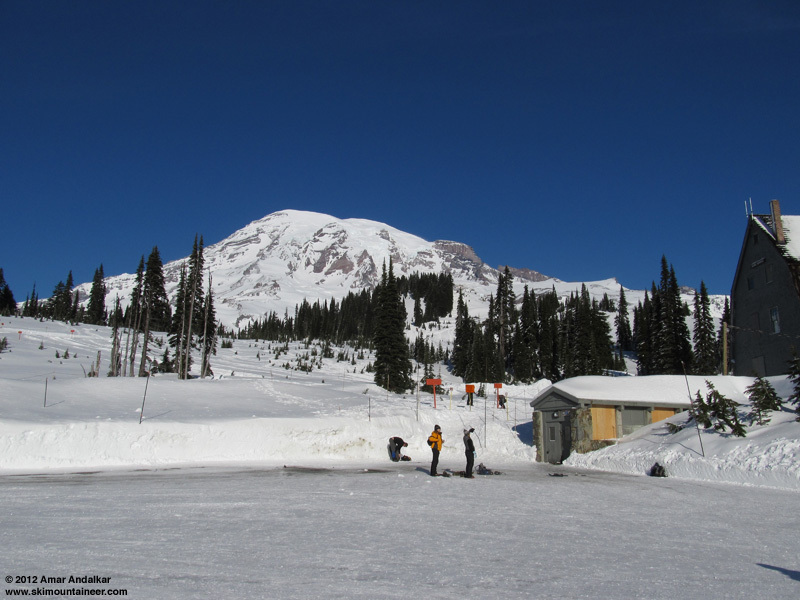 Park maintenance staff was also on hand to dig out the ranger hut, service the "facilities", and make sure the radio in the public shelter was in working order. The ski conditions were about the same as Sunday, totally tolerable and fairly smooth windpack if you stayed far enough to skier's right (west), but much more sastrugi farther east. It certainly didn't look terrible to me, and some parts even skied nicely. Took another peek down Nisqually Chute, but just like Sunday, the snow was very firm at the entrance and it didn't seem like a good idea to drop down it. More high clouds were already moving in from the west, and although I was hoping to catch another stunning sunset, I could tell that this one was likely to fade out and not be very colorful. No point in lingering up high today to watch the whole sunset. 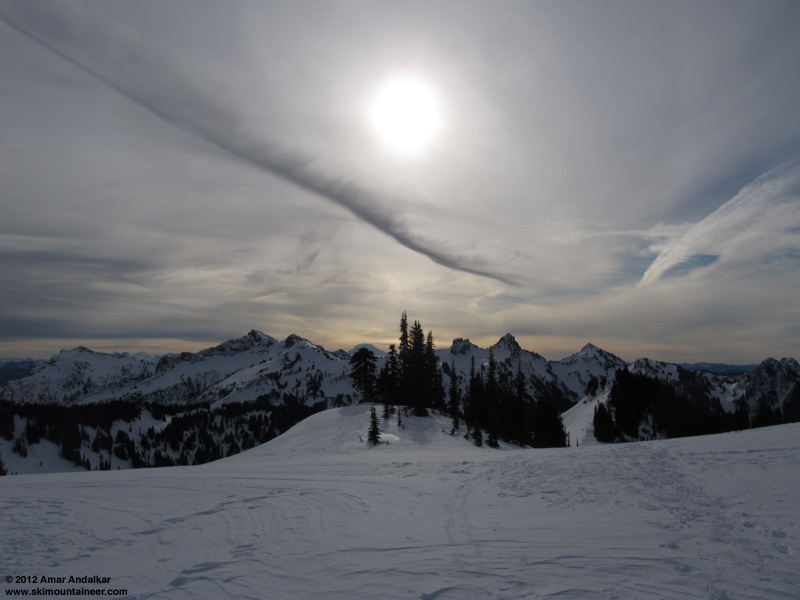 Below Pan Face, I angled towards Alta Vista to get a closer look at these cool areas of icy crust with old fossilized ski tracks. Ski conditions were much better than that almost everywhere else, and it was a quick schuss back to the parking lot just before sunset. Another fine winter day with decent enough skiing on my favorite Mountain. 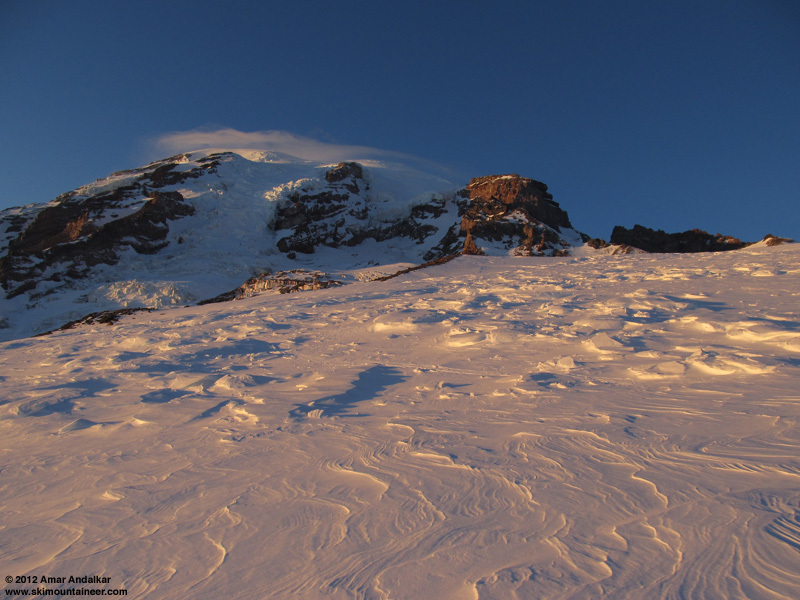 Little could I have imagined the drama and triumph and tragedy that would develop over the next several days, as the incoming storms arrived with a vengeance, with temperatures at Camp Muir plummeting to below 0 �F and winds repeatedly exceeding 100 mph. 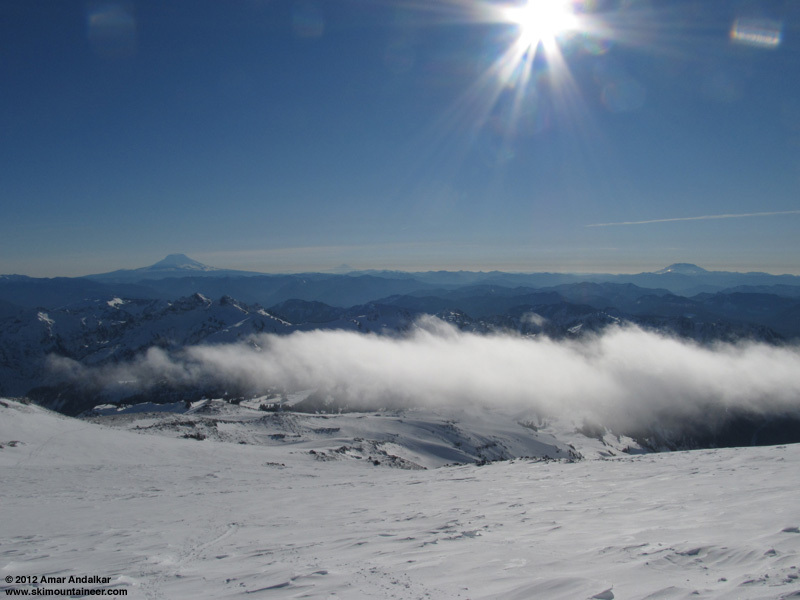 Three snowshoers in two parties would become lost on Saturday the 14th, one of them the subject of a major search, the other couple not even known to be missing. But all of them using their survival skills to endure 2 days out in the cold and storm, all also fortunate to be below treeline where they could find shelter in snow caves and tree wells, until found by search-and-rescue groups on Monday the 16th, safe and almost uninjured. SYNOPSIS...A WEAK WARM FRONT WILL STAY NORTH OF THE PARK TODAY.� A WEAKENING COLD FRONT WILL DROP SOUTHEAST ACROSS THE AREA LATER MONDAY. AN UPPER LEVEL RIDGE WILL GRADUALLY BUILD OVER THE AREA FOR THE MIDDLE OF THE WEEK. SUNDAY...PARTLY SUNNY. FREEZING LEVEL 7000 FEET. SUNDAY NIGHT...MOSTLY CLOUDY WITH A CHANCE OF RAIN AND SNOW AFTER MIDNIGHT. SNOW LEVEL 6500 FEET. MONDAY...RAIN AND SNOW LIKELY IN THE MORNING...THEN RAIN AND SNOW IN THE AFTERNOON. SNOW LEVEL 5500 FEET. MONDAY NIGHT...SHOWERS LIKELY IN THE EVENING...THEN A CHANCE OF SHOWERS AFTER MIDNIGHT. SNOW LEVEL 3000 FEET. TUESDAY...PARTLY SUNNY. A CHANCE OF SNOW SHOWERS IN THE MORNING. SNOW LEVEL 2000 FEET. TUESDAY NIGHT THROUGH WEDNESDAY NIGHT...MOSTLY CLOUDY. FREEZING LEVEL 4000 FEET. THURSDAY...PARTLY SUNNY. FREEZING LEVEL 6500 FEET. FRIDAY...MOSTLY CLOUDY WITH A CHANCE OF SNOW AND RAIN. SNOW LEVEL 4500 FEET. FRIDAY NIGHT AND SATURDAY...CLOUDY WITH A CHANCE OF SNOW AND RAIN. SNOW LEVEL 3000 FEET. SYNOPSIS...AN UPPER LEVEL AND SURFACE RIDGE WILL REMAIN OVER WESTERN WASHINGTON THROUGH FRIDAY...KEEPING THE WEATHER MOSTLY SUNNY...COOL AND DRY. A COLD FRONT WILL BRING A CHANCE OF RAIN AND SNOW TO THE PARK SATURDAY. AN UPPER LEVEL TROUGH WILL MOVE DOWN OVER THE AREA SATURDAY NIGHT BRINGING AN AIR MASS COLD ENOUGH TO PRODUCE SNOW SHOWERS INTO EARLY NEXT WEEK. THURSDAY...MOSTLY SUNNY. FREEZING LEVEL 5500 FEET. THURSDAY NIGHT...PARTLY CLOUDY. FREEZING LEVEL 7000 FEET. FRIDAY...MOSTLY SUNNY. FREEZING LEVEL 6000 FEET. FRIDAY NIGHT...MOSTLY CLOUDY. FREEZING LEVEL 6000 FEET. SATURDAY...MOSTLY CLOUDY WITH A CHANCE OF RAIN AND SNOW. SNOW LEVEL 5500 FEET. SATURDAY NIGHT AND SUNDAY...SNOW SHOWERS LIKELY. SUNDAY NIGHT AND MARTIN LUTHER KING JR DAY...SNOW SHOWERS. MONDAY NIGHT THROUGH TUESDAY NIGHT...SNOW SHOWERS LIKELY. You're ruining my street cred. Here's a few shots of Amar in his element. Nisqually glacier/icefall sets the backdrop & debris flow adds extra texture.